On the eve of the match against Kolkata Knight Riders, Samson said he hopes to keep the momentum going. IPL 2018 Rajasthan Royals, Sanju Samson. 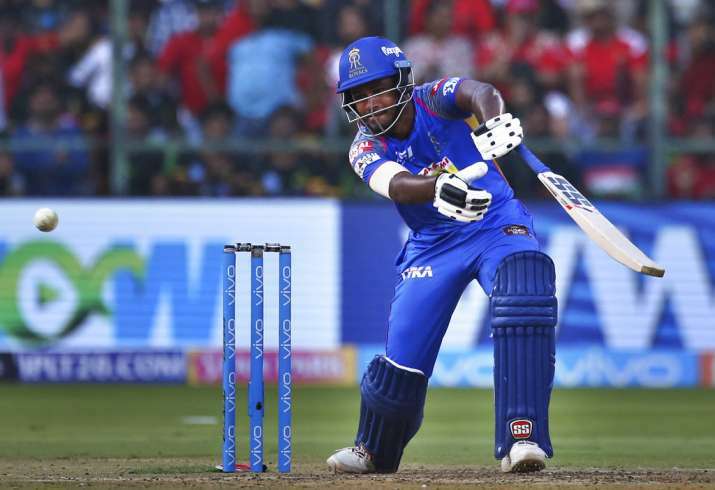 Fresh from his 45-ball 92 against Royal Challengers Bangalore in the ongoing IPL, in-from Rajasthan Royals batsman Sanju Samson today said he was on the right track. "It is good thing to come here and play. The whole world is watching. I had a good domestic season too. I am happy the way things are going. I am improving as a player and also improving my skills," said Samson, who has been praised by the likes of AB de Villiers and Shane Warne. "I have batted in almost all positions in the batting line-up. I remember I had opened too for Rajasthan Royals. What matters is the strategy and composition of the playing XI." Asked about the bigger ground here and his team's plans to tackle the KKR spin attack, he said, "We are prepared for that, it is different ground and there has to be change in the game plan. I would be starting from zero. "Our plans are simple, we would be playing with same plan and energy. Jaipur is our fortress and we wish to continue with the winning streak here. The wicket too is familiar to us." Rajasthan Royals has had a hectic schedule in the tournament, playing back to back games. "The schedule for IPL is always hectic but we have to recover quickly, maintaining the spirit and taking rest.